Headed up the North Fork today. Even though there are still 3 weeks of official winter left, it’s 50 degrees here and the spring breakup is in full force and that means the road is in bad shape. I’ve tried to find places to stop and shoot, but as soon as I slowed down, the car sank into the mud and slush. Underneath the slush, though, is a thick layer of solid ice and once the you hit that, the car isn’t going anywhere. Plus, I didn’t even have a shovel, so if I did get stuck I wouldn’t have been able to dig myself out. But the show must go on. I drove for several miles before I found a safe place to pullover. I had an awesome view of the Livingston mountain range. I used the RED to do an 30 second, in-camera timelapse of the morning sunrise illuminating the mountain range. Before the sun came up the sky was overcast and kind of gloomy, but as the sun rose, the clouds thinned out. The resulting video is beautiful. On the way back out, I spotted maybe 60 head of elk. They were grazing on private property on the edge of the park and I couldn’t get close enough to get a decent shot. I plan to come back in the next few days and hopefully they will be on park land next time. 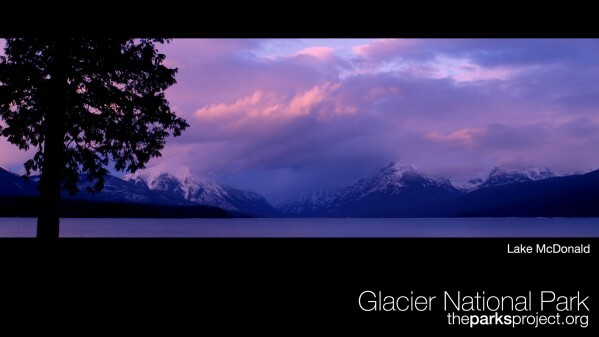 Sunrise Timelapse of Glacier Park from Tempest HD on Vimeo. Lake McDonald on February 23, 2010. Shot in 4k with the RED. to the Goat Lick area but there were no mountain goats to be found. 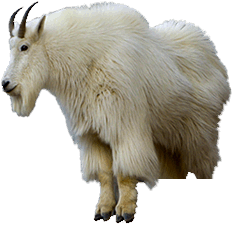 I spent the next few hours hiking around the river looking for any mountain goat signs but no such luck. Lake McDonald at dusk. I’ll post a wallpaper right after this post. If you’re looking for more information about the 2010 Glacier Centennial make sure you check out the Centennial page on the Park’s website. 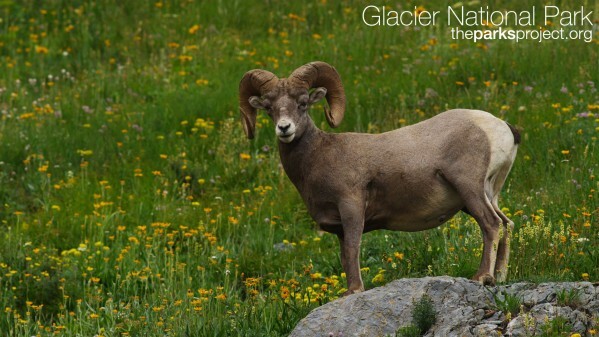 Kass Hardy, the Centennial Coordinator for Glacier National Park maintains a Centennial Blog which should be a great resource as the fun begins. 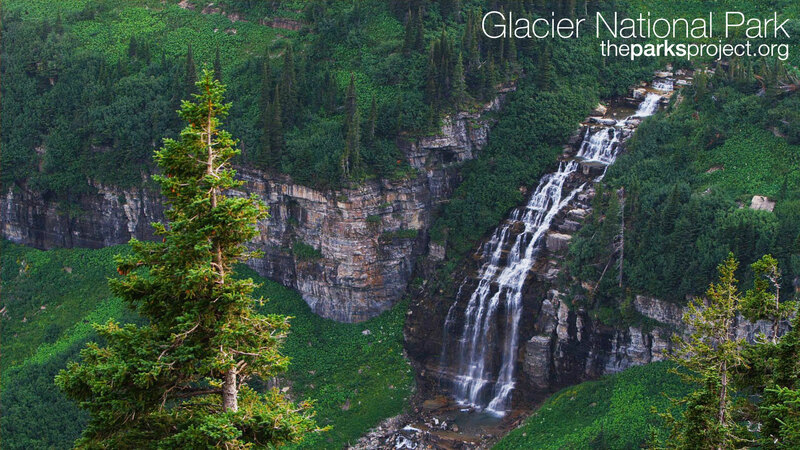 Finally, you can also Visit Glacier National Park’s Official Centennial Website at http://www.glaciercentennial.org/. At the moment all of these pages seem to have similar content but I’m sure they will be updated as the summer season approaches. When we first started talking about the Glacier Bluray project, I wanted to do it as “on location” as possible. That meant camping in park with just a tent, the camera, and a laptop. But we realized that it’s winter time right now and trying to do any meaningful work on a laptop when it’s 10 degrees in the tent is near impossible. Instead, I opted for a hotel on the edge of the park. It’s a win-win scenario; I can hike into the park during the day and edit footage in the evening in the warmth of a hotel room. Normally all of the hotels are closed in winter because the park is officially closed. I called all of the hotels on both the east side and the west side of park looking for some place to stay for the next month. Joe and Mary came to our rescue. 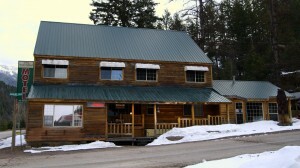 They run the Glacier Highland Motel in West Glacier. Joe graciously offered to open the motel just for us. I can’t thank him enough. And here is the modest editing station. 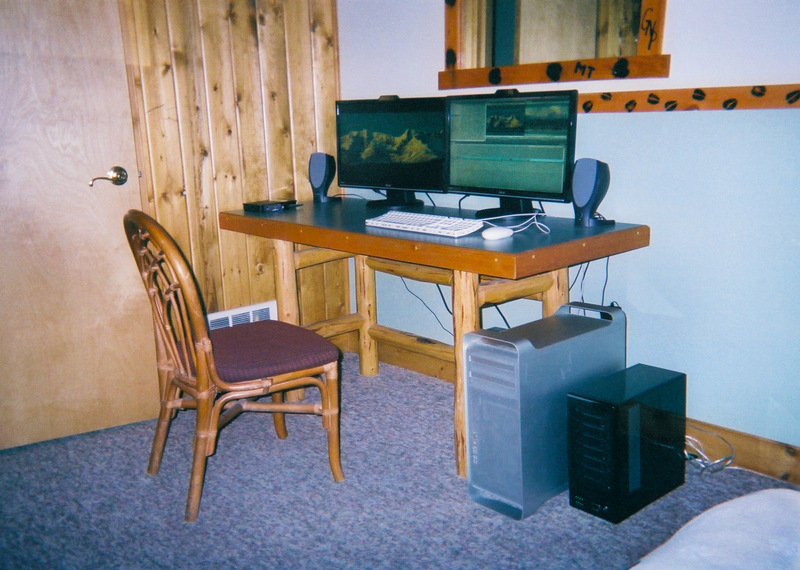 I’ve got my Mac, a pair of 24″ monitors and the 10 terabyte hard drive array.